When EU countries visualise an ideal immigrant, a highly-skilled and educated immigrant comes to mind. For many, the highly-skilled and skilled represent the only ´legitimate´ form of immigration. EU immigration policy in its current form is characterised by three main dimensions: attracting highly-skilled workers, deterring irregular migration, and promoting the integration of third country nationals. The EU approach is one of increased migration management so that Europe receives legal migration, particularly in sectors that are lacking in personnel. The increased emphasis on cooperation both with countries of origin and between Member States, as reflected in the Global Approach to Migration adopted in 2011, is part of this drive to more efficiently manage migration. EU migration policy is therefore implicitly based on the assumption that low-skilled labor is no longer needed, and indeed, would be harmful to the European economy at a time of economic crisis and high unemployment, especially among youth. Low-skilled workers receive little attention at the EU level, with the exception of seasonal workers and in some bilateral agreements with individual EU countries. But is low-skilled immigration always unwelcome? A case study of low-skilled employment in the Italian dairy industry reveals that immigrants from the Punjab region of India have successfully inserted themselves into this sector of the Italian economy, without ´stealing´ jobs from native Italians. How did Immigrants Manage to Enter into the Dairy Sector and convert it into an economic niche? The dairy industry in Italy is the most important sector of Italian agriculture, with an annual turnover of 15 billion Euros in 2011 (all dairy products), including 2 billion Euros worth of cheese exports. In Italy, dairy consumption is ´recession proof´, with Italians continuing to consume dairy products, including high-quality DOP (Protected Denomination of Origin) dairy products, despite the slowing of the Italian economy. Indeed, 87% of Italians consider their national DOP cheeses to be the foundation of the ´Made in Italy´ brand. Indians have thus inserted themselves in a sector that is not only economically important, but also key to Italian identity. Dairy work has since become a Punjabi niche market, with 90% of the workers in this sector estimated to be Indian. According to 2008 data from Istat, (the Italian Institute of Statistics), 42.9% of Indians work in the agricultural sector in the Lombardy region, compared to only 2.8% of the total foreign population, showing a marked tendency for Indians to concentrate in agriculture, particularly in Northern Italy. The socioeconomic context leading to the Italian exodus from cow milking provides the background necessary to understanding how a low-skilled immigrant group has been able to enter and dominate a key domestic industry. A number of factors led to this Italian exodus from the dairy sector. The mechanisation of the industry beginning in the 1950´s led to a sharp reduction in the number of jobs available, forcing Italian youth to look for work elsewhere. Secondly, the economic boom that Italy experienced in the post-war period led to new aspirations that working in the cascine (dairy farms) could not fulfill. In particular, the houses on the cascine were increasingly abandoned in favor of more modern urban housing. Finally, the low social status associated with cow milking was an additional incentive to look for other work, even when the salary was raised and working conditions improved considerably with mechanisation. Male bergamini (cow milkers) could not find local marriage partners and had to resort to finding spouses from other Italian regions. This native exodus from dairy milking led to demand for a reliable and steady source of labour that could replace Italian workers. In the region of Lombardia, the agricultural sector is distinguished, unlike in other parts of Italy, by the need for a specialised, stable and ´regular´ (i.e. legally documented) workforce that is highly available, in order to be able to adapt themselves to the demanding rhythms of a dairy farm and avoid high turn-over, which would harm productivity. Immigrant labour from India has met this demand for specialised labour that does not require a high level of education. The need for a dependable, ´regular´ workforce has meant that work in the dairy industry has avoided the systematic abuses and severe exploitation characteristic of Italian agriculture in other regions. Sources from the largest Italian union, the CGIL (Conferazione Generale Italiana di Lavoro), have indicated that the vast majority of immigrant workers in this sector possess legal contracts. The Italian dairy industry is therefore a good example of the continuing need for low skilled third country labour in certain sectors of the European economy. Nor is it the only example: the area of geriatric care is another sector in which immigrant labour has proved to be critical, without harming national employment. While EU expansion can absorb some labour shortages, it cannot be assumed that all occupations will benefit from EU enlargement. In the UK, where migration policy has been completely closed to low-skilled workers (including in the case of temporary labour shortages), restaurant owners, especially from the ´ethnic´ restaurant sector, have raised concerns about the unfairness of a points-based immigration system that only considers skilled workers who possess formal qualifications. The need for low-skilled labour is structural and continues to exist despite high rates of unemployment across Europe. In the case of the Italian dairy industry, native workers have spurned this sector despite its relatively high salaries, as well as other perks, such as free accommodation and ample opportunity to earn more via working overtime. The current thinking that accepts that third country nationals are needed in certain high skilled occupations in order for Europe to remain competitive, must also be extended to specific low-skilled sectors. EU migration policy should therefore take into consideration a sectoral approach when seeking to attract third-country nationals to the EU. Promoting only highly-skilled migration misses out on a number of sectors that need low-skilled immigrant labour in order to continue to thrive. Creating more opportunities for legal low-skilled migration can also contribute towards preventing irregular migration. Low-skilled does not mean ´no skill´, and can also be a pathway to other forms of employment, particularly entrepreneurship, in the future. Indeed, an increasing number of Punjabis who initially worked in the dairy sector are now establishing their own small businesses across Northern Italy. European Journal, “Italy: Sikh Cheese Producers”, Deutsche WelleEnglish, September 20 2008 08:12, accessed March 13 2012, http://www.podcast.tv/video-episodes/italy-sikh-cheese-producers-4887664.html. Gardani et al. Turbani che non turbano: Ricerca sociologica sugli immigrati indiani nel cremonese. Provincia di Cremona: Osservatorio provinciale sull´immigrazione, 2002, 1-71. (see p. 30). Grimwood, Gabrielle. Immigration: Points-Based Immigration and the Restaurant Trade. London: House of Commons Library, 2009. There are many populist myths surrounding migration. One that is commonly shared is migrants moving, en masse, into so called ‘richer’ countries irrespective of the job market. The rationale follows that with more immigrants rising unemployment ensues. To date there is no strong evidence to support such claims. Contrary facts highlight a lack of evidence to such assertions. A basic and telling example is a simple pair of correlations which highlight the relationship between overall immigration levels and unemployment. Each EU country with sufficient data has two correlations; pre-recession and recession. Although correlations cannot claim a causal link between two events (A causes B), what they can do is signal any potential links between two phenomena. In this case there is a clear, consistent and telling set of trends. Figure 1 shows correlations for 23 EU member states. The greyed area signals weak correlations, hence little can be taken from such results i.e. Sweden, Belgium and the United Kingdom. There are two types of country. 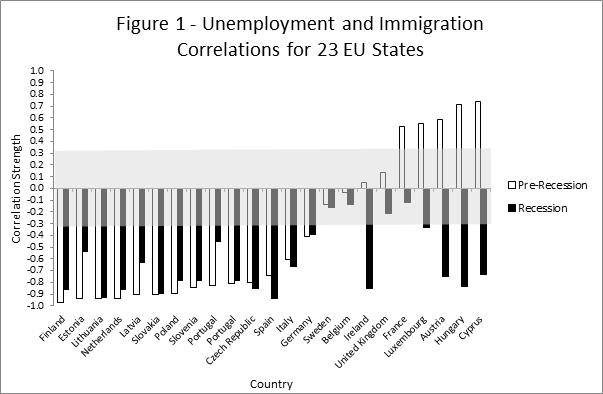 In figure 1 from Finland to Belgium all pre-recession and recession correlations highlight a negative correlation between unemployment and immigration. In short, there are two ways at interpreting these results: (1) the higher the rate of unemployment the lower the rate of immigration: unemployment deters potential migrants; (2) rising immigration lowers the levels of unemployment: immigration generates net employment. Correlations cannot claim to prove either hypothesis but the consistency in these 16 country results does signal a widespread and linked relationship between rising unemployment and decreasing immigration or vice versa. The second type shows a pre-recession positive correlation between unemployment and immigration in the cases of France, Luxembourg, Austria, Hungary and Cyprus. Prior to the recession claims could be made that rising unemployment and immigration were linked. Once the recession occurred all of these countries saw a shift to negative correlations. France shifted to a weak negative correlation whereas the remaining countries moved to significant negative correlations. In all cases there are negative correlations after the recession – unemployment and immigration are negatively linked, a rise in one means a fall in the other. Germany is an important and ‘average’ example of negative correlations in both pre-recession and recession times, with all results baselined to quarter 1 of 2012. In both time periods when there is a decrease in unemployment (red line) there is an increase in immigration. 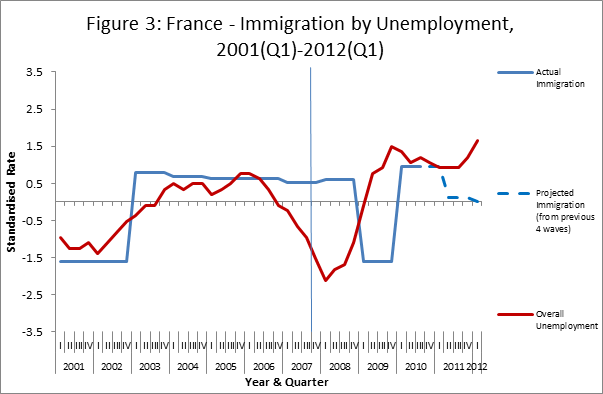 In the case of France (figure 3) there is a fairly consistent trend in the immigration levels, with fluctuating levels of immigration. However when the recession took place the levels of unemployment and immigration took an interesting turn – unemployment rose, immigration fell, a negative correlation. 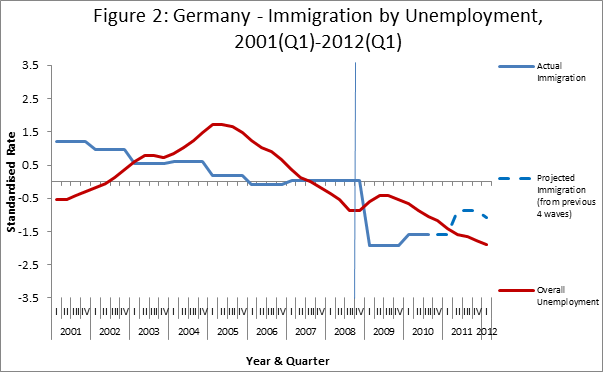 There are many examples of more in-depth studies that highlight very similar results to the ones above (see ‘’ The Labor Market Impact of Immigration and its Policy Consequences’ by Herbert Brücker – http://www.migrationpolicycentre.eu/docs/MPC%20ASN%202012-04.pdf. Although it must be noted that Brucker’s paper includes emigration as well as immigration). Although no definitive answer can be found by correlation analysis it is clear that there is a very consistent and telling trend in the relationship between unemployment and immigration. When unemployment lowers, immigration tends to increase. Results from this analysis suggest that immigration cannot be regarded as a factor that creates or adds to unemployment. In fact the opposite conclusion is more plausible; migrants are likely to move to where jobs are available, especially since the recession took place. A recommendation for policymakers is to utilise immigration to stimulate to employment. For example, if unemployment rates are lowering, nation states should look to increase the rate and number of immigration. Furthermore, a continual populist myth of ‘high immigration = high unemployment’ needs to be responsibly tackled by the media, especially when there is little to no evidence supporting such claims. Unemployment and immigration are complex phenomena but it looks like the relationship between the two has a simple rule of thumb – low levels of unemployment create higher levels of immigration.